themed packs kit thématique "joyeux cirque"
All E-Glue wall stickers and decals for kids are co-designed and handmade in our workshop from premium materials (source : France and Germany), therefore ensuring a great customer service and high quality finish from design to product then secure packaging to delivery. Our clean, clear and unique graphic designs have been created by specifically working on lines, curves and outline shapes to get both some volumes and a perfect balance as wall décor, avoid large flat areas, make easier the application, use a laser cutting process only and not printing solutions. No solvent, ink or other chemical is applied to the surface of our wall decals ; E-Glue can therefore guarantee a safe environment to kids. Our kids wall stickers are made from solid color matte vinyl films, providing deeper and richer colors that do not degrade over time. It requires a long time to cut each color separately then hand-assemble each part so that each wall sticker comes in one piece, on their single mount to make easier the application. They are completely removable, so safe to use on your home walls without worry about stickiness left behind. Specifically adapted for walls, our ultra-thin wall decals lay beautifully on surfaces for a realistic look. All you get is the image and after applying they look like they are stenciled on with paint. All parts you see in « white » will have the color of your wall (no clear acetate, no edge, no background). 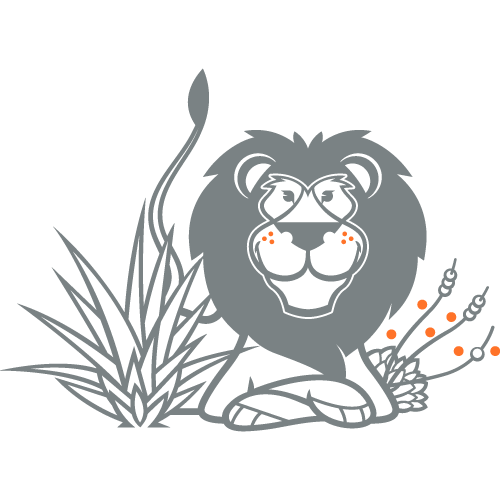 For example, see below the decal lion (grey and orange) applied on a light grey wall. All wall decals E-Glue are made to order, according to options selected by our clients (colors, sizes, pack content, etc...), and shipped worldwide within 2-5 working days. The delivery time depends on your delivery address and the shipping service you choose. We ship worldwide for more than 10 years, even to Tasmania ! Our safe and shock-proof packaging was therefore designed to make sure that they stand up to the abuse they're likely to endure while in transit (wall decals sealed then wrapped in bubble wrap, packed into a cylindrical kraft tube and another very strong cardboard box). 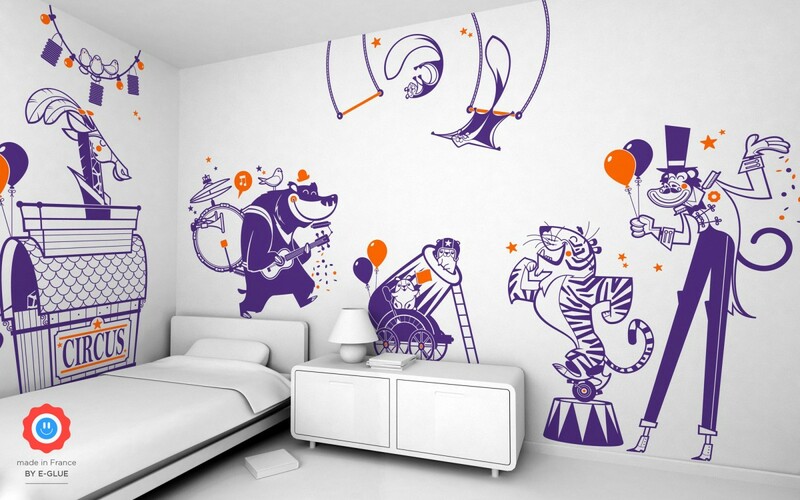 For any order of E-Glue wall decorations (kids wall stickers, giant murals, custom wallpapers), we add our installation instructions to help you easily install your decor. Download them for free on this page, into your favorite language (French, English or Spanish), to reprint or to read them on screens. Our color chart enables you to truly appreciate our different solid colors and helps you to customize your wall decals. Please also note that it’s possible to get sticker samples on request (6 colors per shipment) ! For that, just indicate your delivery address and favorite colors by email, using the same color names as ones on our chart to avoid errors. E-Glue wall stickers are completely removable, so safe to use on your home walls without worry about stickiness left behind. Self-adhesive wall decals are suitable for almost all flat smooth surfaces that are clean and dry (during the application) ; the vinyl manufacturer guarantees a 10 year life indoors and confirms its compliance with the European norm REACH & ROHS. Anyone can peel and stick a vinyl wall decal ; on top of that, each order comes with instructions, a plastic scraper for mounting and little surprise gifts !